Our Magnificent Things from South Slope/ BCSD Library on Vimeo. After littleBits students worked with another cool new technology: Makey Makey. What is Makey Makey? 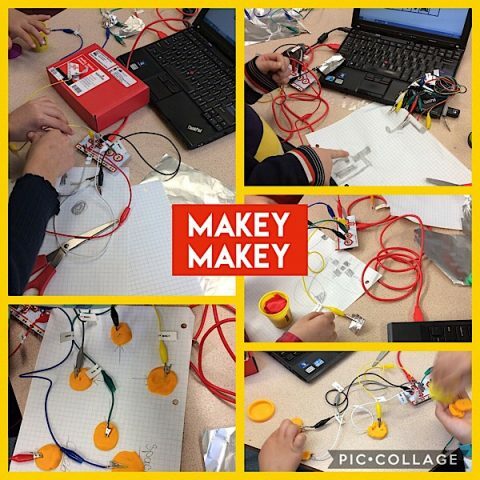 “Makey Makey is perfect for the classroom. Students can invent projects that combine the tactile materials of the classroom with the coding projects they’re creating on the computer to bring their creations to life. Students experimented with different materials and learned what materials conduct electricity and what materials act as insulators. We had a lot of fun!!! Finally, in teams, students participated in design challenges using everyday materials like straws, newspaper, paperclips, marshmallows, tape and pipe cleaners. Teams were given a limited amount of materials to complete tasks such as building the longest bridge, creating a structure that can bear weight and building the tallest structure that can be turned upside down and remain standing. Students reflected afterwards that their success depended on staying focused and working as team. Making Materials Work from South Slope/ BCSD Library on Vimeo.